Can Relief From Stress Mean Pain Relief? Home > News > Can Relief From Stress Mean Pain Relief? Benjamin Franklin once said death and taxes were the only two things said to be certain in the world. Some would argue stress as a strong candidate for that list. 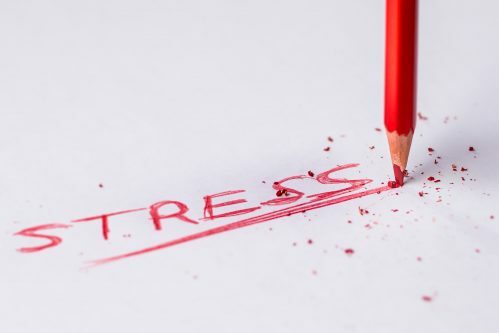 Demands in the workplace, worry over finances and family issues, anxiety over heavy traffic… it may not take much for stress to consume our lives, but it doesn’t have to be part of our daily routines. For those who deal with arthritis or other types of joint pain, one might wonder about a connection. Does stress play a role? Joint pain happens most often as a result of injury or health issues related to, among other factors, aging and illness. It is also believed that rheumatoid arthritis may be genetic. While stress itself may not directly cause joint pain, it may contribute to the inflammation in the joints that leads to aches and pains. Anxiety and tension brought on by a particularly rough day at work, or an emotional event, can also cause discomfort. Set limits on device usage. How often do you catch yourself checking your email at home? During dinner? Before bed? The one drawback to the information age is that we seem to want information all the time, so much that we lose sleep. You don’t have to go off the grid, but it can help to set times at home to be device free. Go for a walk. Exercise is good for the joints, and the mind. A twenty-minute walk through the neighborhood can work wonders on your stress level and in turn keep you flexible and fit. Relax with a hobby. “Self care” is a popular phrase, and at times an important one. Set aside time for something you enjoy – reading, knitting, gardening – and focus on the joy it brings you. For direct treatment of your joint pain, the physicians and staff at Bon Secours can provide the right solution for your needs. Talk to us today about non-surgical options to help with your knee, elbow, shoulder or hip pain.